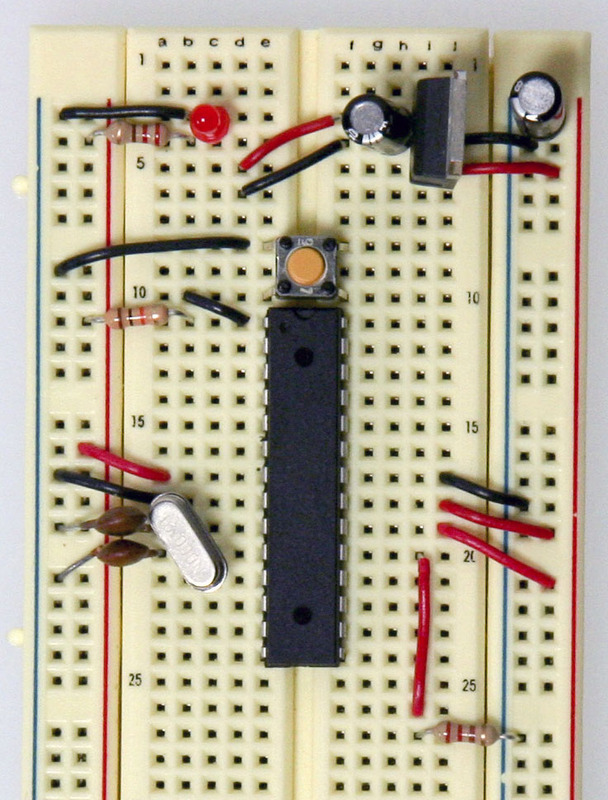 This tutorial shows you how to build an Arduino compatible breadboard with an Atmel Atmega8/168/328 AVR microcontroller and FTDI FT232 breakout board from SparkFun. You could also use the Arduino USB Mini. If you plan to use the top option and have not yet soldered headers to the breakout board, now would be a good time. Add an LED and a 220-ohm resistor on the left side of your board across from the voltage regulator. An LED attached to power like this is a great troubleshooting trick. You'll always know when your board is being powered as well as quickly know if your board is being shorted. The chip used on this board is actually already programmed using the blink_led program that comes with the Arduino software. If you already have an Arduino printed circuit board running, it is a good idea to go ahead and check the breadboard version you are building with a chip you know works. 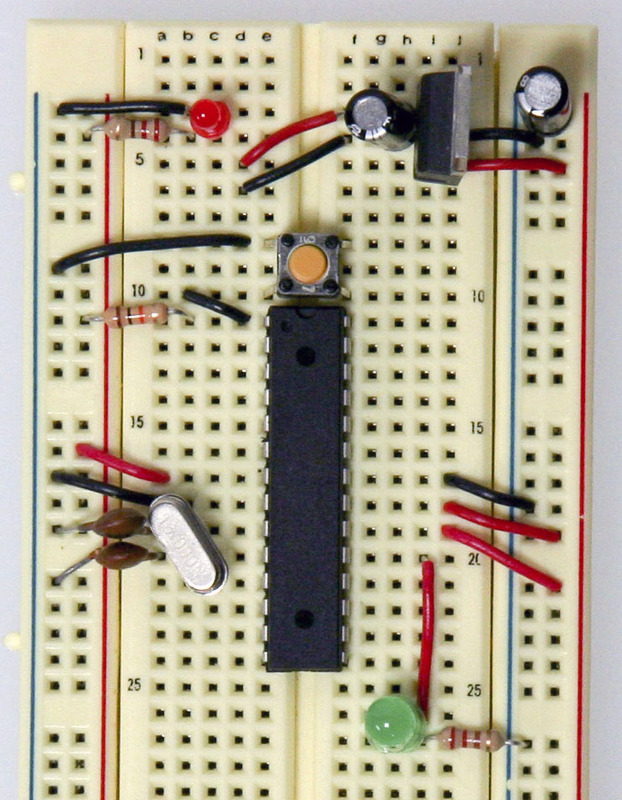 Pull the chip from your working Arduino and try it on this board. 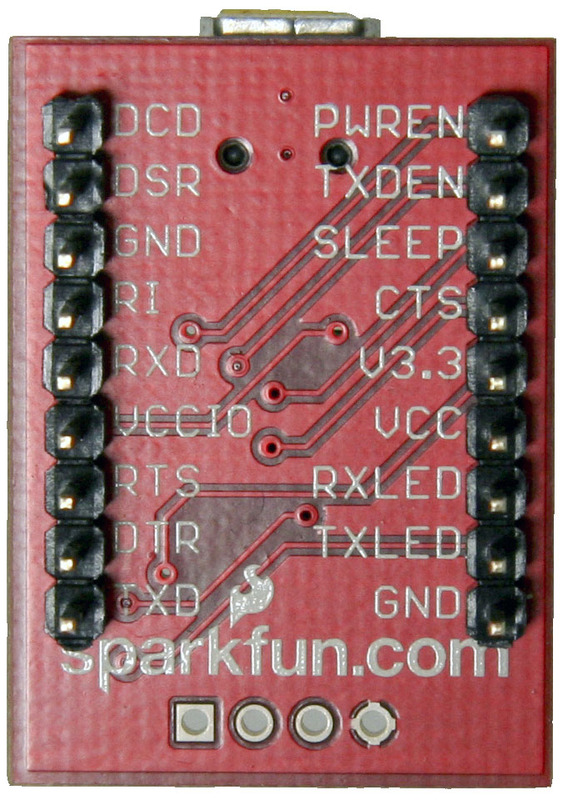 The blink_led program blinks pin 13. Pin 13 on the Arduino is NOT the AVR ATMEGA8-16PU/ATMEGA168-16PU pin 13. It is actually pin 19 on the Atmega chip. Refer to the pin mapping above to be sure you are plugging it in correctly. Finally, add the LED. The long leg or the anode connects to the red wire and the short leg or the cathode connects to the 220 ohm resistor going to ground. Now we'll be adding the USB to Serial breakout board to our Arduino breadboard circuit. 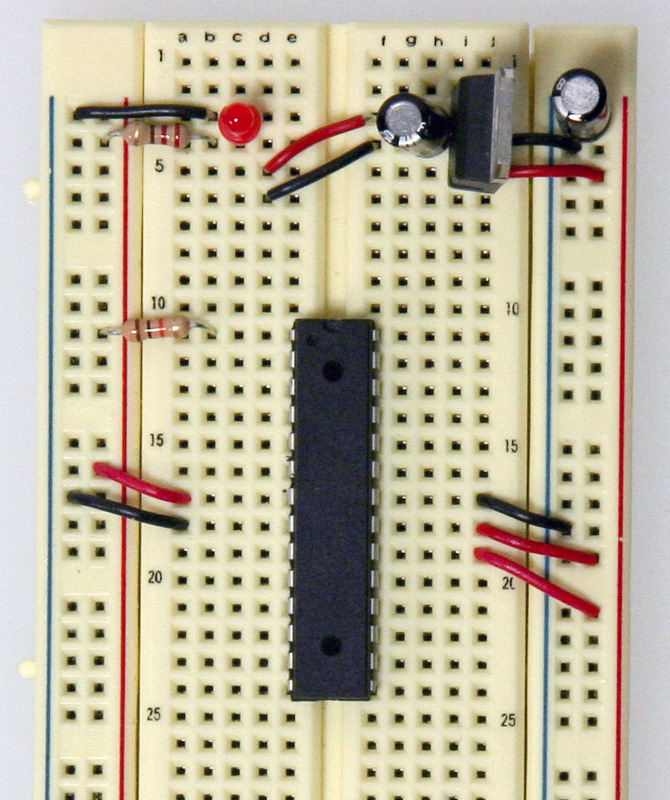 If you haven't added male headers to your breakout board, you will need to do it now. 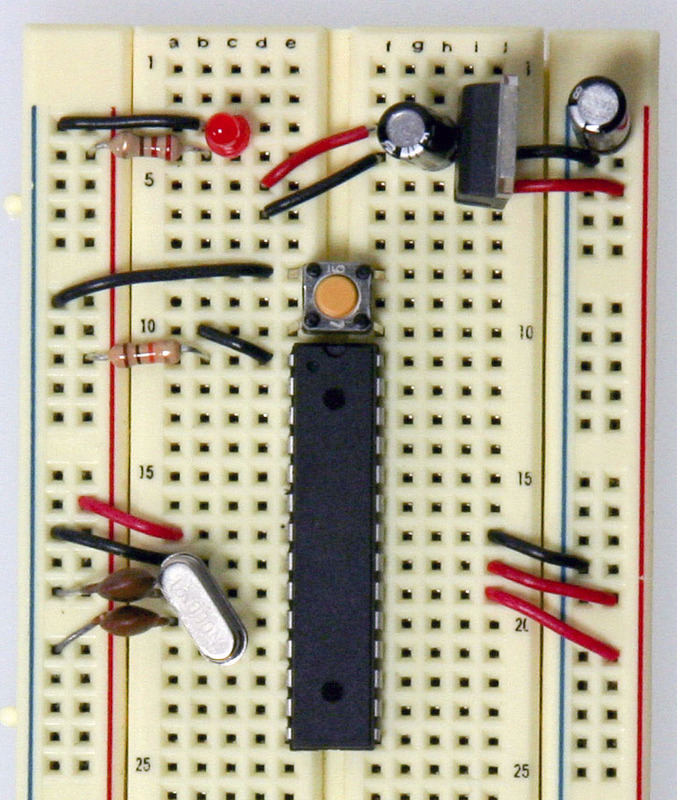 Connect the VCCIO of the breakout board to power and the GND to ground. Curious what all the pin outs are for the SparkFun FT232 breakout board, just simply flip it over! In this situation we'll be using VCC (to supply 5V from the USB port to your board), GND, TXD, and RXD. 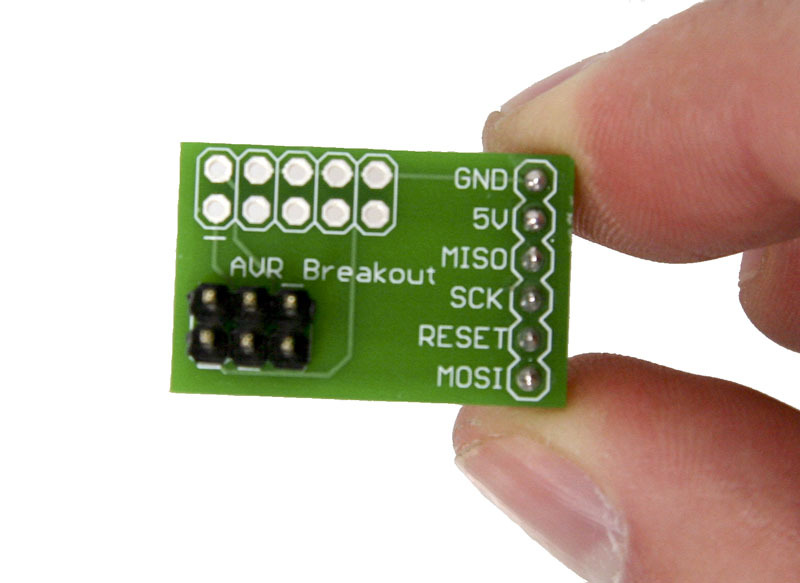 Now, it's time to get the USB to serial breakout board talking with your new Arduino setup. Connect the RX (pin 2) of your Atmega chip to the TX of the USB to serial board, and connect the TX (pin 3) of your Atmega chip to the RX of the USB to serial board. And there you have it... ready to be plugged in, powered up and programmed! But wait, there's another step right? If you pulled your Atmega chip out of your Arduino, it has most likely been programed several times by yourself and so it definitely has been bootloaded, so you won't need to move any further in this tutorial. However, if you purchased some extra Atmega328 or Atmega168 chips from an online store they will have NOT been bootloaded with the Arduino bootloader (with the exception of Adafruit Industries). What does this mean? You won't be able to program your chips using the USB to serial breakout board and the Arduino software. So, in order to make your new chips useful for Arduino you MUST bootload them and MUST check out step 4. This configuration is similar to the one above but the trick is that the Atmega chip is bootloaded with the Arduino Lilypad bootloader. The Lilypad runs using the internal clock instead of an external clock and so removes the need for much of the supporting circuitry. There are two options for bootloading your chips. The first being quite easy and the other being a little more tricky. We will cover both. 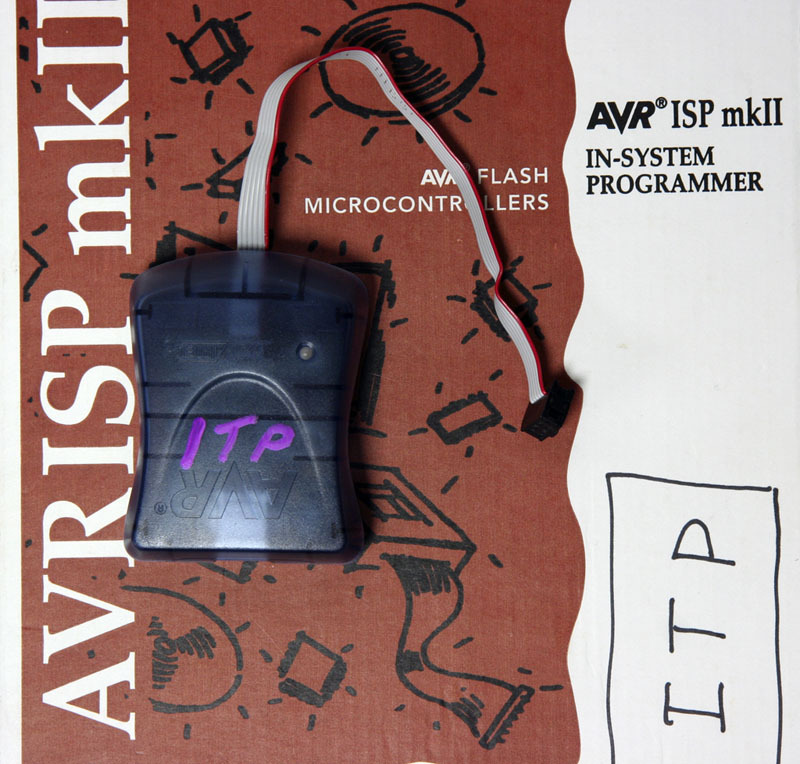 The AVRISP mkII can be purchased from Digikey (Part # ATAVRISP2-ND) while the USBtinyISP must be assembled and can be found at Adafruit Industries. 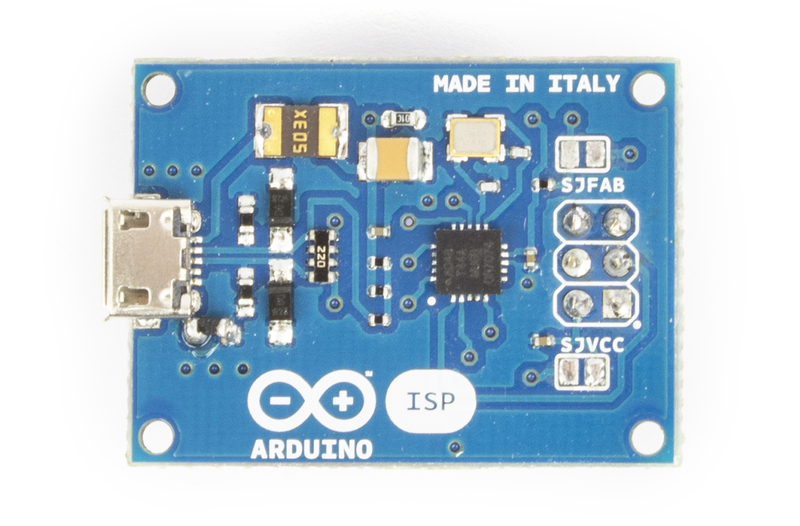 The documentation and the links to the Arduino Store and to the distributors list can be found in the ArduinoISP product page. 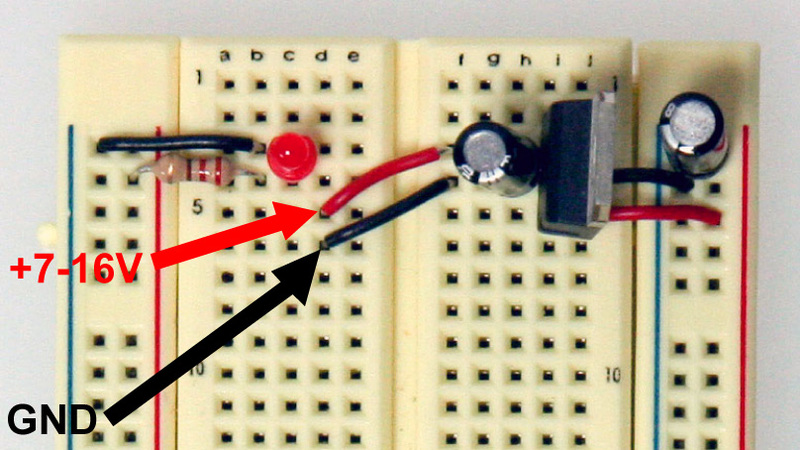 Place your Atmega chip into the Arduino board with the divot of the chip facing outward. Set the jumper to an external power supply and connect a 12V power brick (your board needs to be externally powered when using the AVR ISP mkII but is not needed with the AVRtinyISP) . 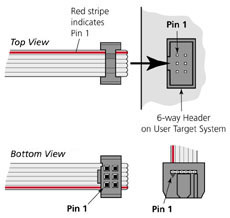 Then, attach the 6-pin female plug of your AVR programmer to the 6 male header ICSP pins with the plastic nub of the ribbon cable head facing inward. NOTE: The AVR ISP mkII turns its LED green when they've been hooked up correctly and are ready for programming. The LED turns red if it is hooked up wrong. 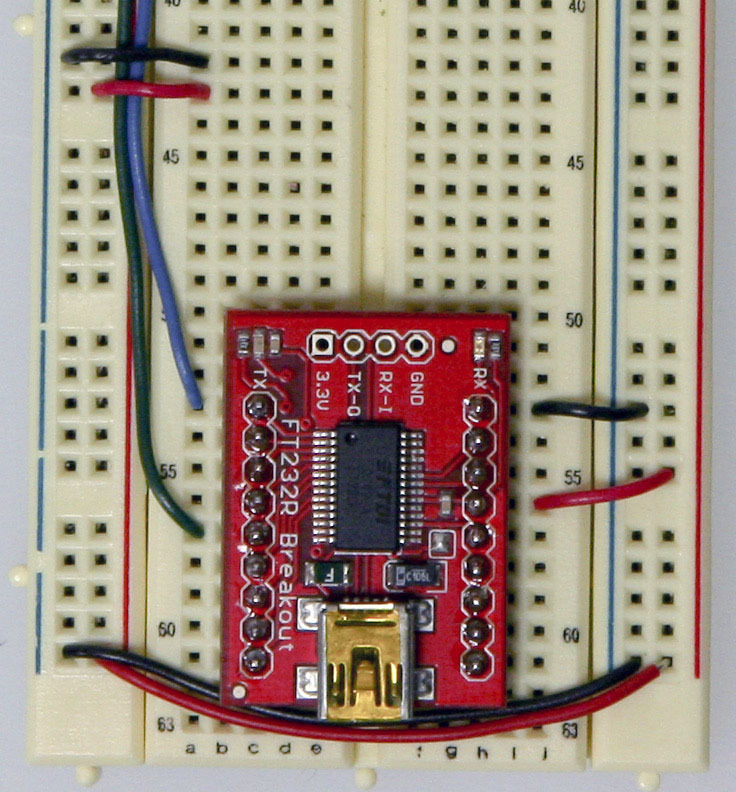 When bootloading an Atmega chip on a breadboard, the AVR programming adapter (SKU BOB-08508) from Sparkfun is incredibly handy. 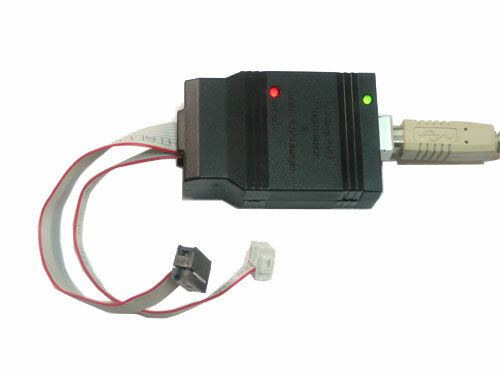 This adapter breaks out the 6 pins from the programmer to 6 inline pins for easy attachment to the breadboard. All the pins are also labeled making it very easy to connect it up to your chip. Don't worry, if you don't have an AVR programming adapter you can still bootload without it. It will however be more of a headache to set up. The two images to the left are great references when hooking up a programmer to an Atmega chip without an adapter board. The images will tell you what all the holes in the 6-pin AVR plug are and you will simply need to stick wires in the end and run them to your Atmega chip. This image is a view from the bottom and labels each of the holes. Take note of the square as to what orientation your cable is in. 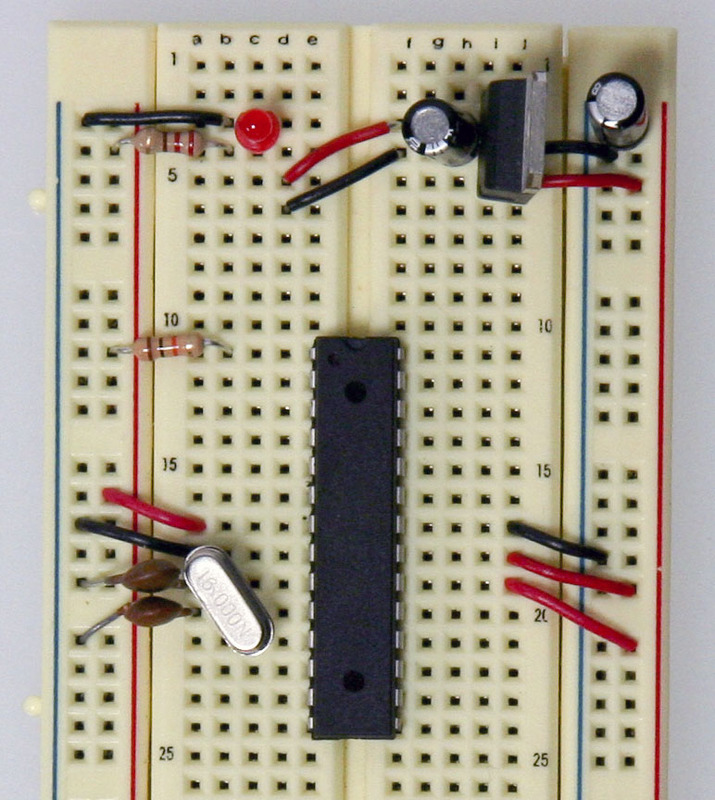 With the breadboard you prepared above, add two wires for power and ground for your AVR programmer. Now plug the AVR programming adapter into the breadboard with the GND pin matching up with the ground wire you just ran and the 5V pin matching up with the power wire you just ran. In this step you will need to add the last four wires needed by the AVR programmer for proper bootloading. Be sure to refer to the Arduino pin mapping for help wiring this up. 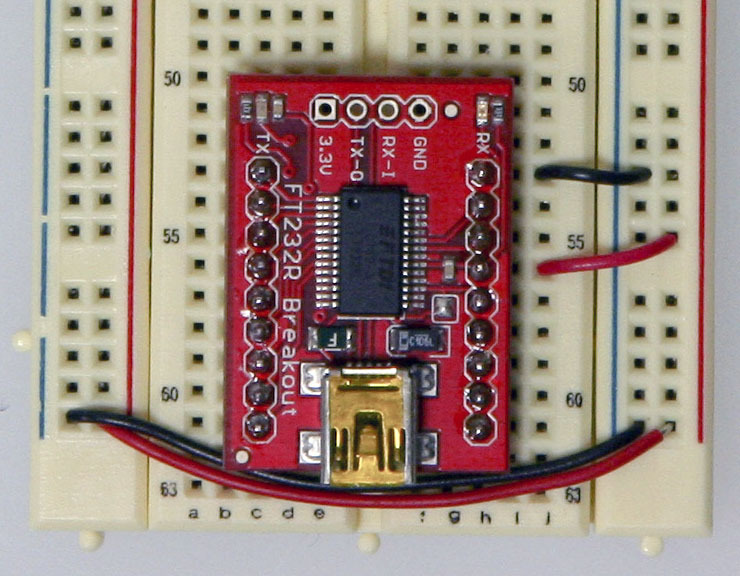 The MISO pin of your adapter will go to pin 18 or Arduino digital pin 12 of your Atmega chip. 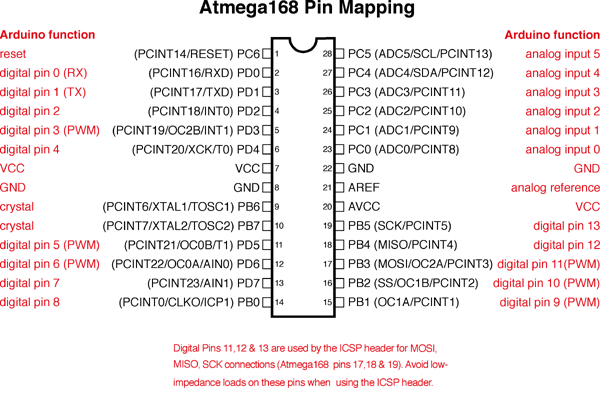 The SCK pin of your adapter will go to pin 19 or Arduino digital pin 13 of your Atmega chip. 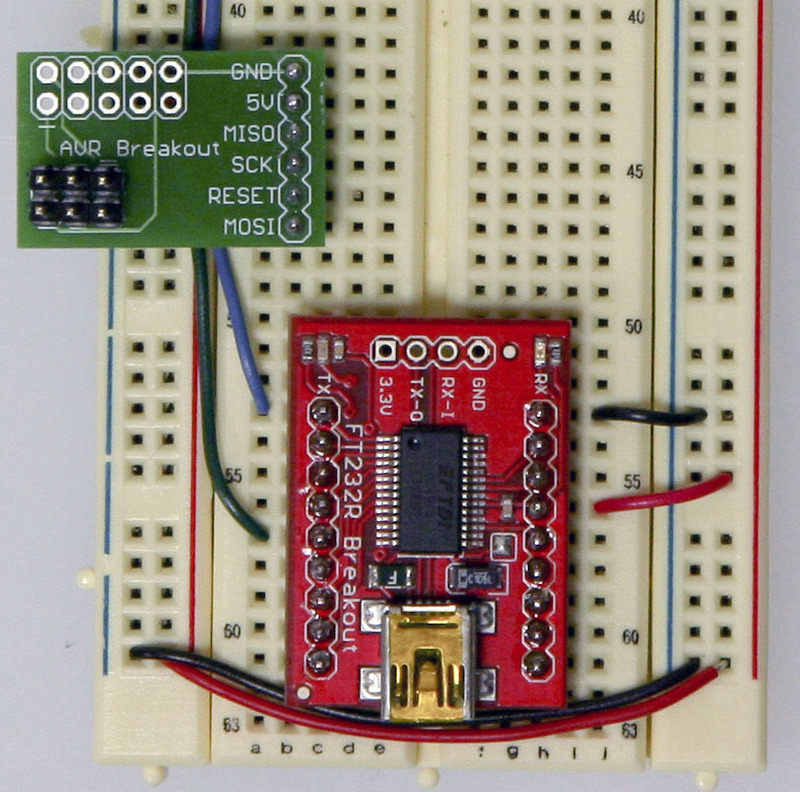 The RESET pin of your adapter will go to pin 1 of your Atmega chip. The MOSI pin of your adapter will go to pin 17 or Arduino digital pin 11 of your Atmega chip. Almost there! Just plug in a USB cable to your USB breakout board and plug the 6-pin plug of your AVR programmer to your AVR programming adapter. The black nub of the 6-pin head must be facing upwards towards the Atmega chip. 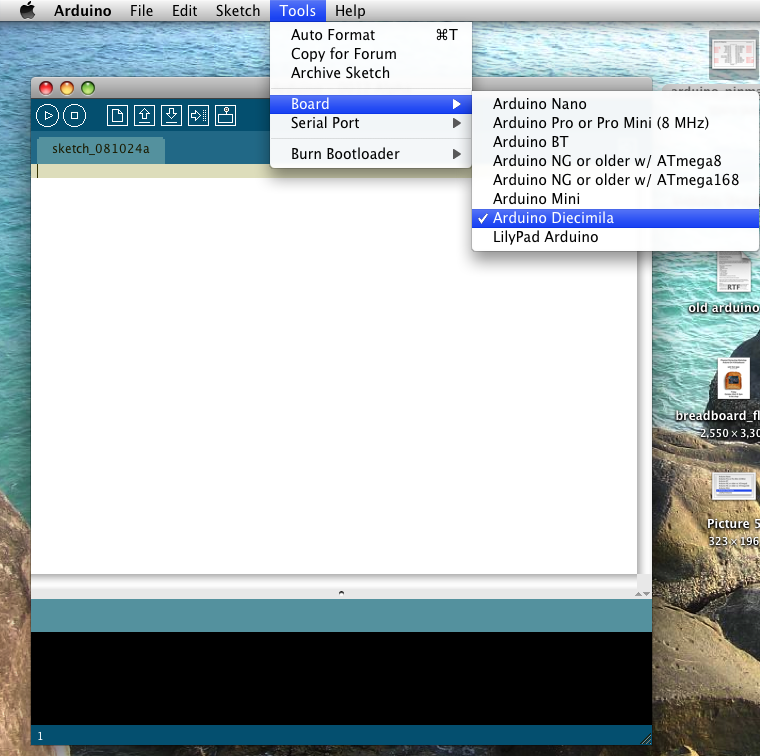 In the next step, we'll show you have to use the Arduino software to burn your bootloader! Fire up Arduino and then go to 'Tools' and 'Board'. Choosing the type of board you'd like to use will effect which bootloader you will be put on your chip. 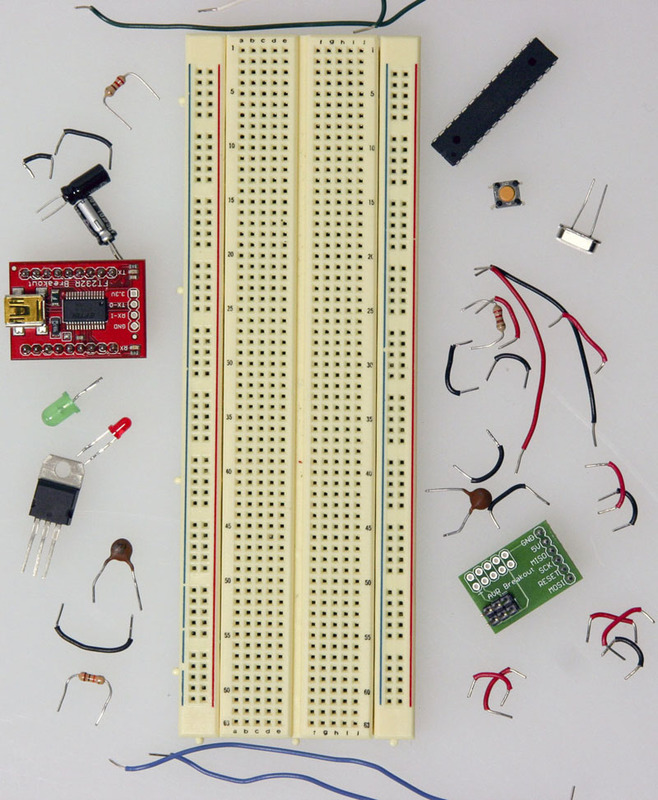 Most commonly you will be using the Diecimilia or the most recent version of Arduino for an Atmega PDIP, however if you'd like to bootload an Arduino Lilypad, Arduino Mini, Arduino Nano, or any of the older Arduino versions, choose the appropriate board. 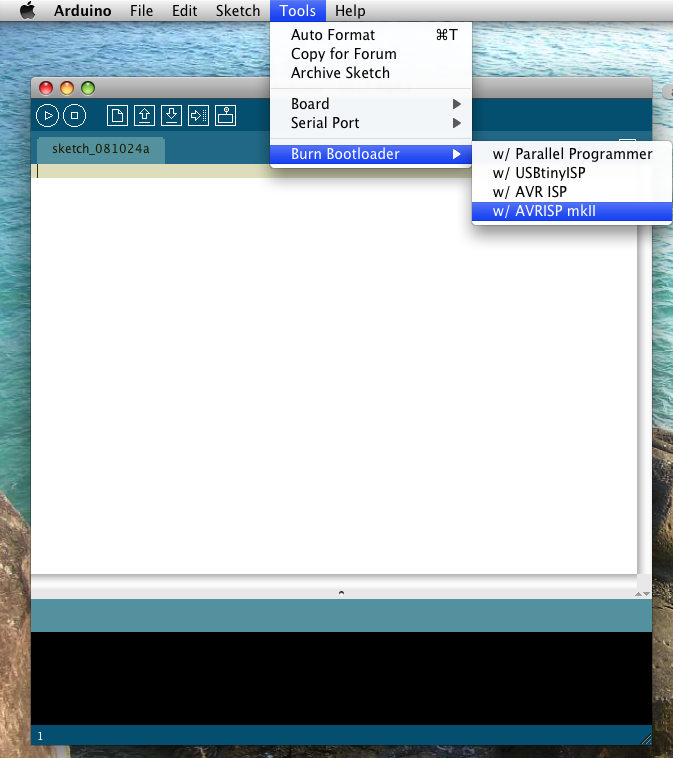 Then, go to 'Tools' and 'Burn Bootloader' and choose the programmer you will be using. 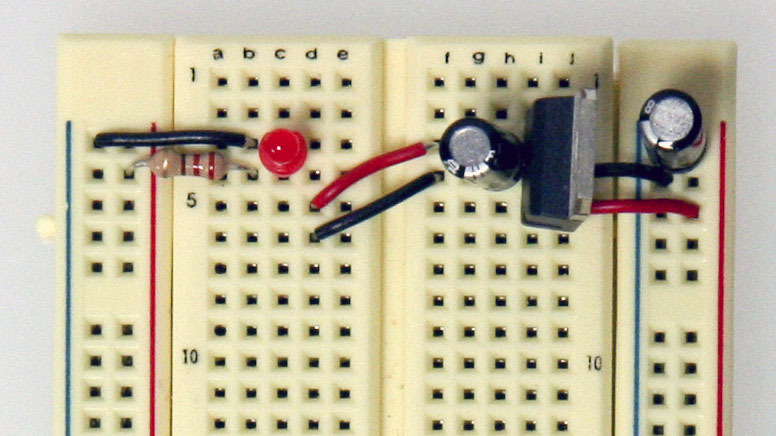 Once you chose your programmer, the AVR programmer will begin bootloading your Atmega chip and a message will appear in the status bar which reads "Burning bootloader to I/O Board (this may take a minute)..." Lights will flicker on your programmer. When done bootloading, the status bar will be updated with the message "Done burning bootloader." 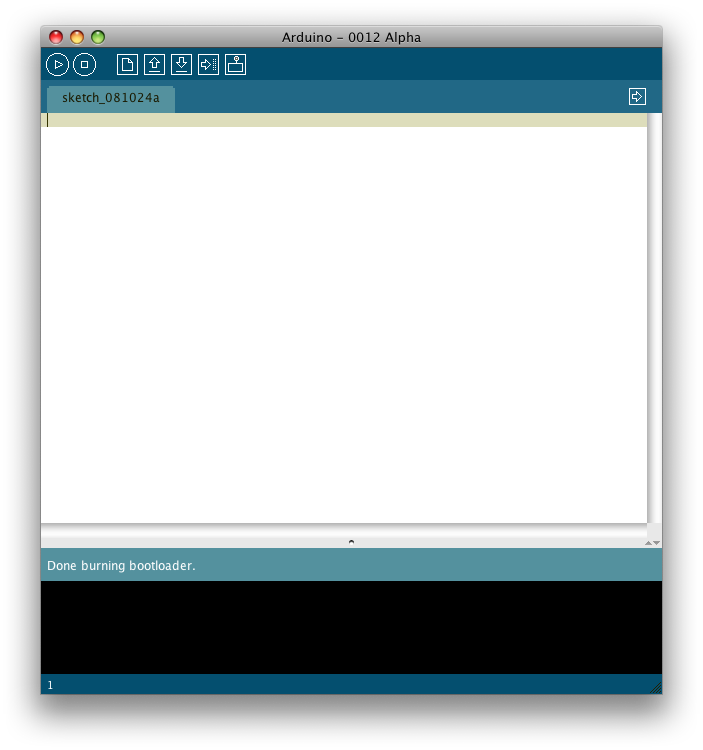 Your chip is now ready to be programmer using the Arduino software! Congrats! 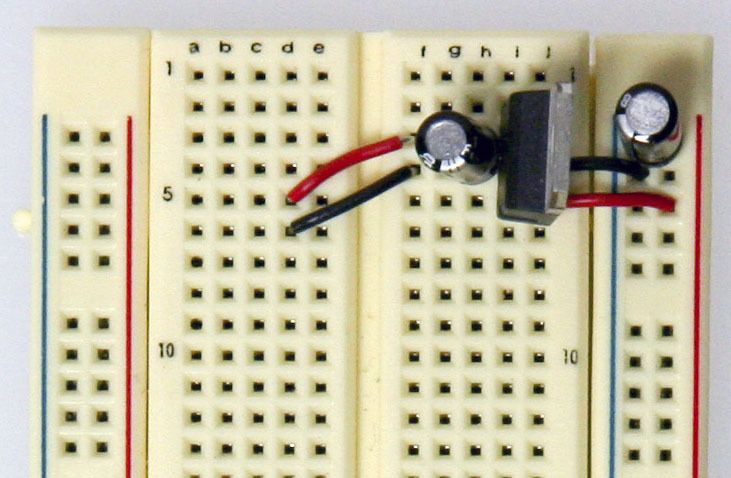 Power cycle your Arduino and your new Atmega chip will be running a simple LED blink program with pin 13 (if this is not the case, try programming it with one). If this is working, it was most definitely a success. NOTE: On occasion, the process of bootloading an Atmega chip with the AVR ISP mkII will take an extraordinarily long period of time. Usually it should only take a couple minutes and in fact, the AVRtinyISP finishes much quicker. However, there are times where after 5-10 minutes it still appears to be bootloading. I found this to be an odd hiccup (perhaps it is triple checking the data flow) and after giving it ample time, 10 minutes or so, I usually unplug the programmer only to find the burning process to be a success and has ended long ago. I by no means endorse this method and you take all responsibility in whatever may happen to your chip, but in my experience it has been fairly harmless though you should proceed with caution. It is very possible that you may damage your chip in the process.